I had a summer love once. I was a young teenager at that tinderbox of all youthful summer romances, summer camp. In those days, parents sent their offspring to such places telling them that it would be a “great learning experience”. Truth was of course that as soon as the bus pulled away mom and dad popped the wine cork and celebrated with a vacation of their own. Today I imagine that such places still exist, however with the advent of electronic babysitters, I suspect the only time children get outside these days is to chase Pokémon. Back when I was a youth however, summer camps were popular and every summer my siblings and I were sent away for a week of “fun”. Truth was I usually hated summer camp. The bugs, the creepy counselors, and after the first Friday the 13th movie came out, well there were other things to be frightened of. There was the one summer however when the trip to camp became a memorable one. I was, I think 14, and in the throes of the boyhood discovery that girls aren’t so icky after all. Sadly, I don’t’ remember her name, only that she was an “older woman”, all of 16. She had dirty blonde hair and sort of blue eyes. We kissed the first time behind one of the cabins, and from that point my life was never the same. I would later learn that she was actually blind in one eye, which explained the way she seemed to look at me with only one eye, her good one I hope. To me, however she was perfect. Flawless. At least until the week at camp ended and we went our separate ways never to see each other again. But that’s why it’s called a summer love; it’s a fleeting moment in time that soon disappears leaving only pleasant memories. While I’m a bit too old now to go to summer camp, I did have a brief summer love recently. 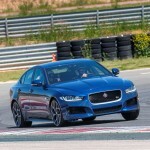 Being a faithful spouse for 35 years, my romances these days are limited to the automobile, so my newest summer romance didn’t involve a blind in one eye girl, but a Jaguar. 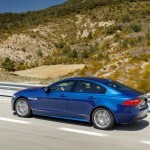 Specifically a Jaguar XE. 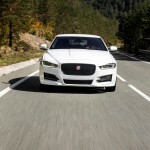 Launched to much fanfare in London in 2014, the mid-size sedan competes against the like of the BMW 3-series, the Audi A4 and Mercedes C-class. 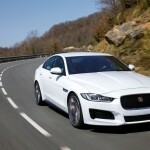 Introduced as a 2015 model, for 2017 America gets this “baby” Jaguar. 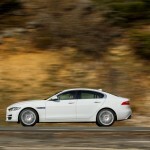 It’s smaller then the XF, and for 2017 gets a new diesel variant and All-Wheel Drive. 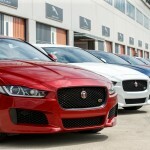 I’ve had a turn behind the wheel of the F-Type, both as an R model, and the convertible. Snarling beasts those. Absolutely great cars. 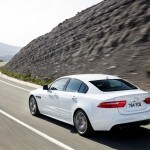 So getting a four-door sedan for a week? 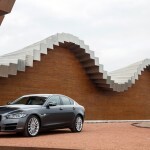 Sure, it will be fun, but not F-Type fun. On first glance, however I was smitten. 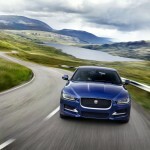 The XE is one of the best looking cars I have seen in quite some time. At first glance it looked like a Maserati Ghibli; no seriously. It took only a moment for me to realize I was besotted. After getting in, I was fully hooked. That’s why at this point I must warn you that everything I write about this car will be done with a bit of bias, okay maybe a great deal of bias. 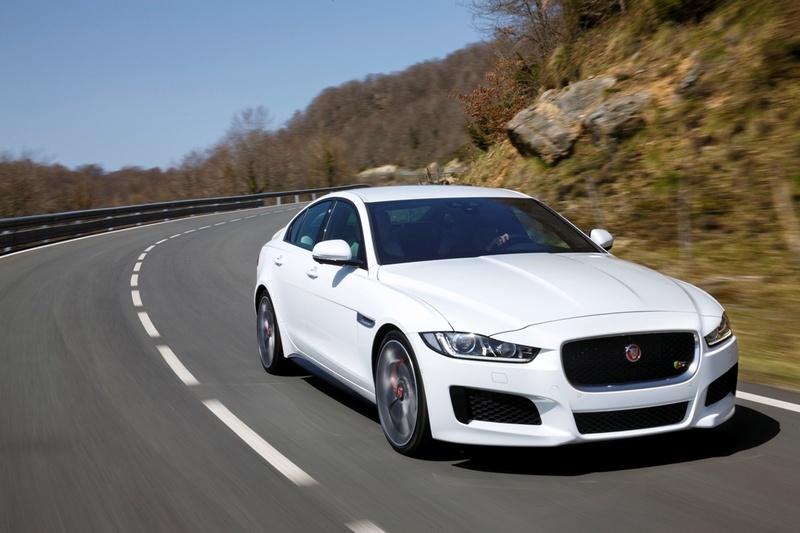 The XE is available in a base, Premium, Prestige and R-Sport variant. The base model has remote keyless entry, push-button start, dual-zone automatic climate control, an auto-dimming rearview mirror and three selectable drive modes (Normal, Eco and Dynamic). There’s also a leather-wrapped steering wheel, eight-way power front seats and a six-speaker audio system with HD radio and an 8-inch central touchscreen. 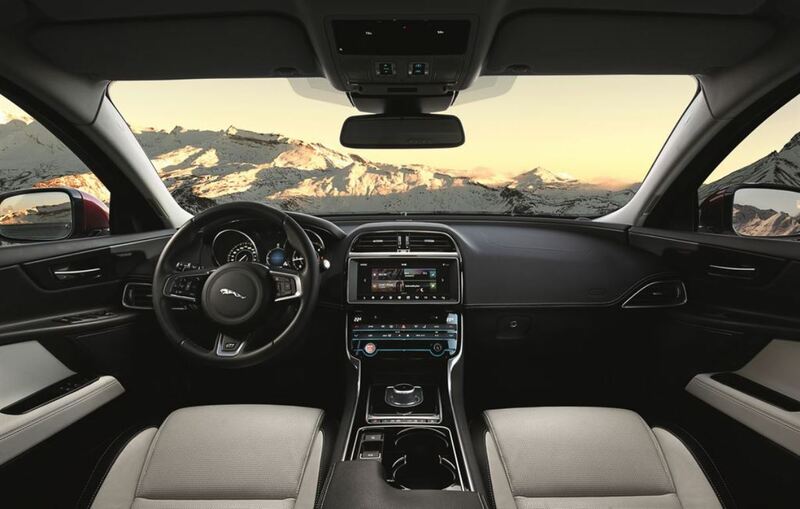 You can option in a navigation system with InControl Apps, all atop 17-inch wheels. Moving up to the Premium, will add driver memory settings, a rearview camera, power-folding auto-dimming side mirrors, and an 11-speaker Meridian audio system with a subwoofer. There are also 18-inch wheels available. The Prestige adds a power-adjustable and heated steering wheel, heated front seats with four-way power lumber, a navigation system with InControl Apps, ambient interior lighting and upgraded leather upholstery. 18-inch wheels are standard, 19-inch available. The top of the line R-Sport has unique 18 and 19-inch wheels, a rear spoiler, distinctive exterior trim details, sport front seats, and a leatherette-wrapped instrument panel, and satellite radio. These is also adaptive xenon headlights with washers, LED running lights, and automatic high beams, along with safety features like lane assist, autonomous emergency braking, and blind spot monitoring. You can get some of the upper range features as options on the lower models, and on the upper models (Prestige and R-Sport) you can add a Black Design package with gloss-black exterior trim, a Comfort and Convenience package with ventilated front seats, heated rear seats, power rear sunshade, and a power trunk lid. 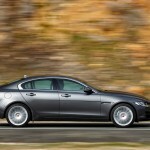 There’s also Jaguar’s Adaptive Dynamics with adaptive suspension dampers and adjustable drive settings, and the Driver Assistance package with adaptive cruise control, forward collision warning with advanced automatic emergency braking, surround-view parking camera, and the autonomous emergency braking. You can even get a parking system, traffic-sign recognition system and the Technology Pack with mobile 3G Wi-Fi hotspot, CD/DVD player, 10.2-inch touchscreen and 17-speaker Meridian audio system. 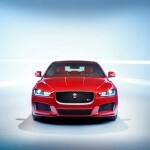 Under the hood, the XE gets either a gas or diesel engine. Each level can have one or the other. There are three types, a 4-cylinder gas (25t), a 4-cylinder diesel (20d), and a 6-cylinder gas engine (35t). The base can get the 25t or 20d, while the Premium and Prestige can have all three engines, and the R-Sport comes in 20d or 35t. 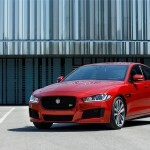 The turbocharged 2.0-liter four-cylinder has 240 horsepower, and 251 pound-feet of torque, the XE 20d is a turbodiesel 2.0-liter four-cylinder with 180 hp, and 318 lb-ft torque and the XE 35t is a supercharged 3.0-liter V6 with 340 hp, and 332 lb-ft torque. All engines are paired with the standard eight-speed automatic transmission; a six speed manual is available. I had the Prestige AWD 20d with the Vision Package that included the Xenon headlights, blind spot monitor and rear traffic detection. While I fell in love with the exterior in a glacier white color, I absolutely swooned when I got in. As is typical in the Jaguar line the interior is no-nonsense with a nice clean functional look. The dash isn’t cluttered and the gauges easy to read. 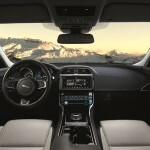 The 8-inch touchscreen (an upgraded 10.2 inch can be had) is easy to reach and Jaguar’s InControl Apps system was easy to use. 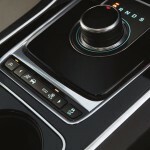 Jaguar’s signature rotary gear selector sits at the bottom of the stack. One thing I have always liked about Jaguar is the simplicity of their interior, it doesn’t seem as pretentious as its German counterparts, and that carries over to the XE. The front seats were comfortable and easy to adjust. The rear seating area is a bit small, but no worse than any of the other’s in its class. 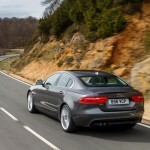 I have to admit that at first the thought of a diesel under the hood of a Jaguar was a bit disconcerting. 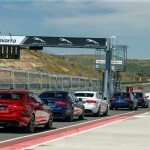 However, the first press on the pedal alleviated any trepidation. 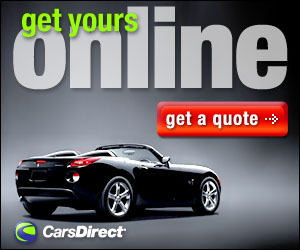 Throttle response is quick and the eight-speed transmission shifts effortlessly. 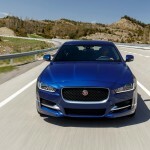 In any case, at the heart of this otherwise gorgeous looking four door sedan there is the beast that is Jaguar, and when called upon it can bare its claws, even with a diesel under the hood. 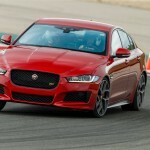 There is after all 318-foot pounds of torque, and that will launch the XE just fine. 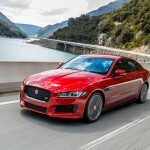 The only thing I did not like about the XE was the auto start-stop feature that shuts off the engine at a stop light, but then again I don’t like that feature in any car, and it can be overridden. 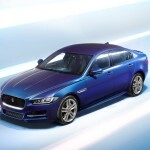 It certainly didn’t jade my view of the XE, sort of like a girl who is beautiful despite being blind in one eye. 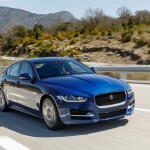 Jaguar has also yet to report the EPA estimated fuel mileage for the XE. 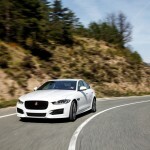 For the Euro version they report 67.3 liters combined, which is nearly 18 mpg when converted. For my week, I measured about 22 mpg in combined conditions. The best part of this whole car is the price. 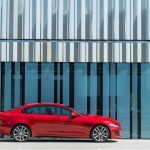 The XE Prestige I had, complete with the turbodiesel 2.0-liter four-cylinder engine with options, has an MSRP of $46,395. After my week with it, I would say that price is a bargain. 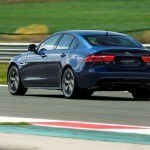 Yes I did fall in love with the XE, would own one, if I could. Alas as with all cars, I had to give it back at the end of the week. The summer romance ended, and it was onto the next car. All the cars run together after awhile, sort of like the summer camps of my youth. 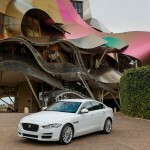 However, just like that one special summer camp, I will have the memory of my week with the XE for some time to come. Maximum cargo capacity: 15.9 cu.ft. Basic: 5 yr./ 60000 mi. Free maintenance: 5 yr./ 60000 mi.